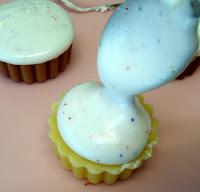 I’ve always wanted to make soap cupcakes but stopped at the frosting. Due to my own laziness, I didn’t want to use many special ingredients, and I find pastry bags totally intimidating! So I decided to do a little experimenting and have come up with an extremely simple and fun recipe that requires 2 ingredients and no fancy frosting tips. I hope you’ll give it a try! Directions: 1. Cut up soap base and reserve 4 oz for frosting. Melt the rest of the soap and color any way you like. I used Buttercream Yellow for the vanilla cupcakes, and Bakery Beige for the chocolate ones. Experiment with a few drops of White Icing color to lighten the shade if you like. Choose any of the yummy scents for your soaps. 2. Fill each mold and allow to harden. Unmold. 3. To make the frosting, melt the 4 oz of clear soap base in a medium mixing bowl. Stir in 2 tablespoons of liquid soap, a few drops of pink colorant, and any fragrance oil you like . Using a whisk or hand mixer, beat mixture until it forms soft peaks. Add 1 teaspoon of the Rainbow Sprinkles from the Sweet Treats kit. Mix until incorporated. 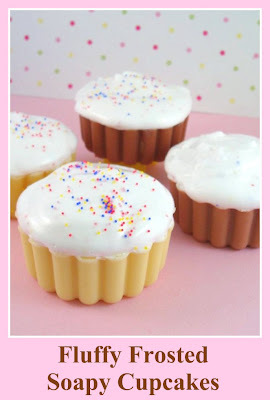 I know this is an old post but now that I'm making loaf soaps, I want to frost the top with peaks and make it look pretty with chunks, embeds and sprinkles! I was searching for an easy way to frost the top of them and came across this post. I had a few questions: I normally use a NO sweat extra hard m&p base. Should I use a regular m&p base for this project – or does this matter? And can white base be used. How long would we whip for and can this be stored to use again? Thanks! Thanks for all of your super enthusiastic comments, everyone! I'm so glad you like it!! Jennifer – I believe that your frosting is turning brown because of the vanilin content of the cake fragrance oil. Most sweet bakery type scents contain vanilin which discolors over time. To remedy this, use equal parts of fragrance oil and the vanilla stabilizer which comes in the Soapylove fragrance kits. Of course, this will only help for your future batches, but at least you know how to successfully make the frosting now! 🙂 Thanks for your comment! Thanks so much for posting this most helpful tutorial. I have a question for you. I made these a few weeks ago, and they turned out perfectly. But, I've noticed that the frosting is now turning brown! It was originally creamy white. Do you have any idea what I could have done wrong? I used clear melt & pour soap base and unscented, clear liquid soap. And I used your cake scent. Thanks for your help. You're a treasure! Anne-Marie, this was the most fun MP project I have had in eons. Thank you posting these instructions – you are such a love for sharing all these insider hints and tricks. I hope you dont mind if I post here in the comments – a link to 2 pics of my first attempt at it. The orangey ones have a marshmallow and bubblegummy kinda scent – the other ones are vanilla, chocolate and the green bits are mint! Thank you, thank you, thank you – the potential for this texture is infinite! Love these, they are totally adorable! Leigh, You're going to LOVE making soap. I have never made soap but this sure sounds like a lot of fun and absolutely the cutest thing ever! Is this too difficult for a first timer? Any suggestions?? Each pound of soap should make around 4 cupcakes. =) I'm so glad that you like the project. Debbie does incredibly creative and fun work. I'm curious approximately how many cupcakes yield from these ingredients? I want to make these for Christmas! they look absolutely edible! i love how the frosting looks so creamy & real. you'll have to put a very large "do not eat" warning on these bad boys. yum yum yum… cupcake fun!!! I believe that any liquid soap base would work. It's the foaming action that's important. I recommend using an uncolored, unscented liquid soap just so you can control this in your soap design. When I looked up the suspending liquid base, it looks like Brambleberry is discontinuing it… can you use any liquid soap base? I feel like our requests were heard! Soapylove tutorials are back! yay! (I know she has her own blog, but somehow the tutorials seem different here). haha and this is a great tutorial too, thanks! Yes, Debbie, I will give it a try! Yay, I CAN make cupcakes. Thank you! These look great and love the simplicity of the frosting recipe. Will give this one a try. Thanks for the tutorial. It is very easy to follow. Those soaps are so cute–look almost good enough to eat! This works good for "meringue" also. I use it on my lemon meingue Pie. Love the sprinkles! This frosting recipe makes me feel like a kid playing with whipped cream! I can't wait to hear what you all think of it – give it a try and let me know! Oh Debbie, I think I love you! 😉 I'm excited about trying this. Thank you for the tutorial…I've been looking forever about how to do this…yay! I spent a weekend trying to figure out something like this a few months ago. Let's just say it didn't work out for me. LOL My husband put my stand mixer away 2 days ago since I gave up. Thanks for bringing the fighter back in me. I've always wanted to know how to do frosting with MP – thanks for this! After spending 40 hours of intense soaping this weekend, this project made me excited to get back to the soap studio! Can't wait to try this! Thanks for the tutorial!